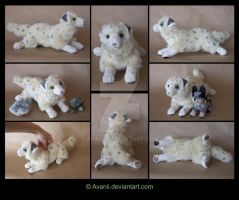 A 35 cm plush commission of Trots the marble fox for He is made of high quality Schulte faux fur (white) and Tissavel (tipped grey), as well as Shannon minky. I've had the grey for years, but always saved it for when my skill was good enough and the right project came by (Tissavel is pretty much the most expensive and luxurious faux fur there is, and it's hard to get hold of). I only have two pieces of Tissavel fabric, one of them being this gorgeous grey. 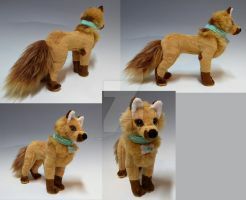 Trots features plastic safety eyes and nose, and embroidered mouth and toes. He has some Copic marker shading around the eyes and trimmed parts of his coat for more realism. He is floppy and super soft and cuddly! Thank you very much! And yes he totally is!